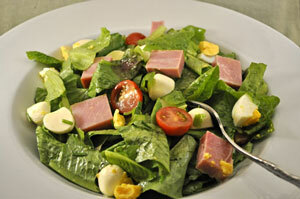 Mozzarella and Ham Salad, Thyme for Cooking healthy gourmet salads. Add 2 - 3 tbs vinaigrette to lettuce and toss well with tongs to combine. Add ham, tomatoes, eggs, cheese and avocado and toss gently. Serve, extra dressing on the side.